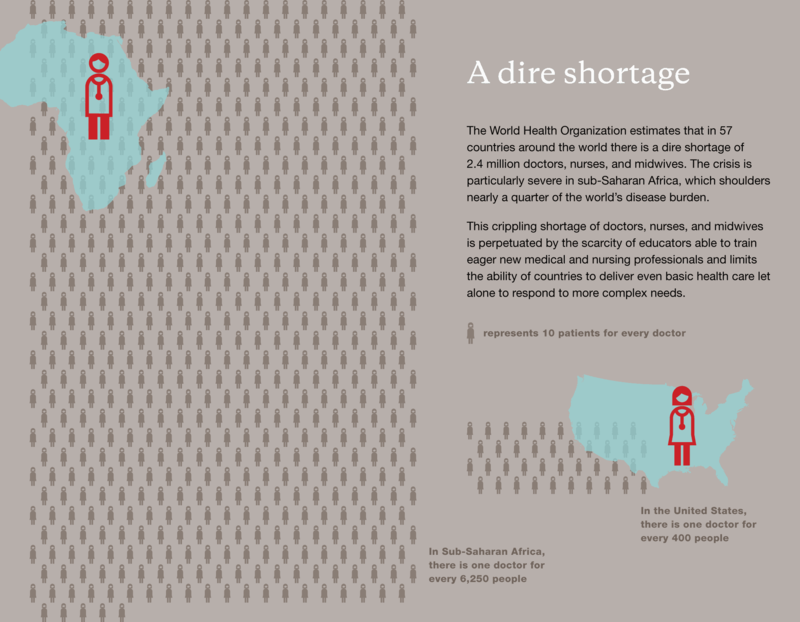 The World Health Organization estimates that in 57 countries around the world there is a dire shortage of 2.4 million doctors, nurses and midwives. The crisis is particularly severe in sub-Saharan Africa, which shoulders nearly a quarter of the world’s disease burden. This crippling shortage of health care professionals is perpetuated by the scarcity of educators able to train eager new doctor and nurse trainees and limits the ability of countries to deliver even basic health care, let alone respond to more complex needs or disease outbreaks. Seed Global Health works in partnership with the Peace Corps and the United States President’s Emergency Plan for AIDS Relief (PEPFAR) to help fill the void by sending US doctors and nurses to mentor and train a new generation of health professionals in medical and nursing schools in Africa. We’ve worked with Seed Global Health since the launch of its unique public-private partnership—the Global Health Service Partnership (GHSP)—and the deployment in 2013 of the inaugural class of volunteers to work in medical and nursing schools in Malawi, Tanzania and Uganda. They tell the story of this novel approach to help alleviate the shortage of health care professionals in under-resourced countries. Our team conducted a messaging session with Seed’s leadership; developed a communications and social media plan; provided social media training; designed promotional materials, including social media ads, fact sheets and brochures for recruiting and development; and provided consultation for a promotional video in collaboration with the Peace Corps. By crafting narratives about the challenges and successes volunteers have faced in the field, we’ve told the story of this promising education model as a solution to help bolster the health systems in Africa. Over the years working with Seed Global Health, we’ve helped this growing nonprofit navigate a name change and secure a name for itself by working to place many stories about founder Dr. Vanessa Kerry, the Global Health Partnership and its volunteers in a variety of outlets, including: NPR, BBC, MSNBC’s Mitchell Reports, MSNBC’s Morning Joe, Boston Magazine, Slate, Science Speaks and allAfrica. Additionally, we’ve helped Dr. Kerry and other Seed Global Health leaders prepare for media appearances and presentations.